As someone that’s watched the film a few times, this line is quite sad with the foresight that Dack has mere minutes of screen time until his death. I was in Target last week and came across this amazingly cool Dack figure! 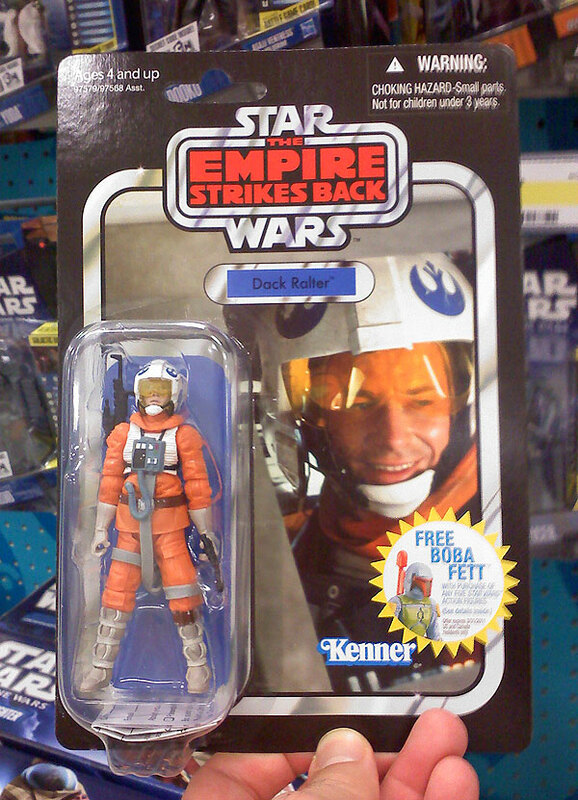 I had no idea they’d finally produced a figure for this hero to expendable pilots everywhere! It’s even on retro-packaging, including the “Free Boba Fett” offer! So very cool. So, what can we learn from Dack? If you ever have a problem with “fire control” while flying, get the hell out ASAP! What I learned from Dack was, “Never, ever sit behind Luke.” We saw Luke in two* aerial/space battles, and both times, the person or droid sitting behind him got nailed. You’d think sticking close to the Jedi golden boy would be the safest place in a battle, but if you ever get between him and the enemy, and you can see his back, you’re hosed. *I guess there was also the skirmish following the Death Star escape, but there was nobody sitting behind him. Clever design on the Millennium Falcon may have been the only thing that saved all of them. I guess I like a little more meat on my Rebel pilots. Ah, that packaging brings back good memories. Having the free Boba Fett mail-in action figure was the mark of a man back in the summer of 1980. I was all of 10 years old when mine arrived in the mailbox, and it gave me huge neighborhood clout until one of the other boys finally scored one! Good times! Thanks for all the comments y’all! Shig – Great observation! They should make a collectors pack of Luke’s dead co-pilots. Chocotaco – Somehow I knew that. Andrew – You actually had the mail-away Boba Fett! My jealous of you knows no bounds. Butz – That’s awesome! I hadn’t heard about that. Thanks! yeah – i didn’t have the original Boba Fett either but I do recall mailing away for Bosk.